I would be lying if I said I wasn’t disappointed. You see, the last few weeks, since my previous stall out and regaining of weight, I’ve been periodically weighing myself during the week and not just on Saturdays. I’m doing this just to make sure I’m staying on track. Well, I stepped on the scale yesterday and I was 1.2 lbs down and now I’m right back up to where I was last week. What the heck? The only thing I can think of is that I ate dinner when I got home from work last night around 10:30. It was a “heavy”-ish dinner (my family’s Mexican enchilada casserole dish that I posted a couple weeks ago) and then I got up about 4 hours earlier than I normally would to go into work for the morning shift on overtime. So, it’s possible that I AM down but, when I stepped on the scale this morning, because my body wasn’t done processing what I ate for dinner last night, I show as though I’m up when I step on the scale. This is why they say don’t live or die by the scale…the scale isn’t the measure of all things…the scale lies. It really does tell dirty, dirty lies. This is proof. The final weigh in and taking of measurements for the Biggest Loser challenge I’m doing is next Friday, (the 13th). I am excited to see what my measurements say. I’m also really hoping that I show as down on the scale. But, really, the measurements are the most important way to gauge my progress. This week was momentous for me. 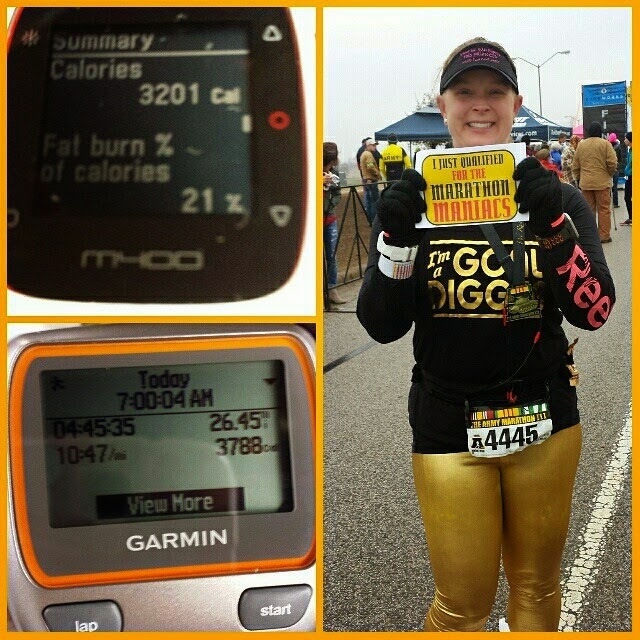 I ran my 3rd marathon in just 78 days on Sunday. 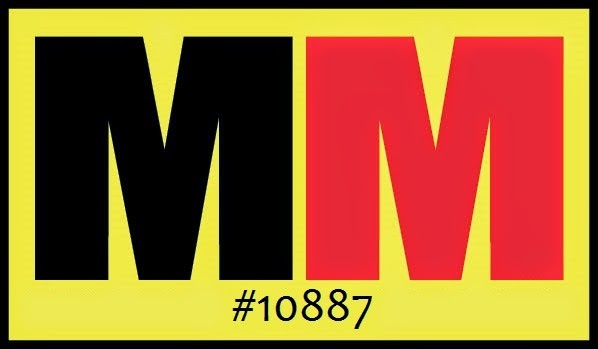 That qualified me for a group called the Marathon Maniacs. I signed up and paid for my membership with them Sunday evening. It was a very emotional electronic transaction for me. I was (and still am) super excited about the membership. 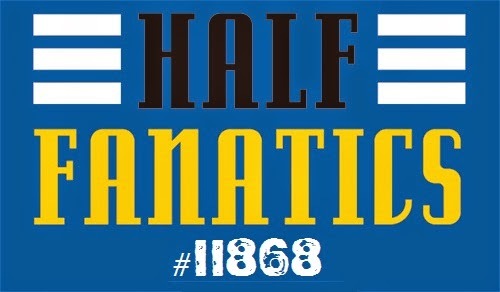 And, even though I don’t have another marathon [tentatively] scheduled until November (either Vegas or South Padre Island, depending on funds), and even though it’s only been less than a week since I ran a marathon, I’m literally already jonesing to run another one. I truly am a maniac. So, I’m not sure I can wait until November to run one. So, I’ve decided, on top of working on getting faster (marathon goal of 4:30:00 and half marathon goal of 2:15:00 or less) that I will just stay trained up for marathons so that if one pops up that I want to and can afford to do, I am ready for it. • Saturday: nada. Just hit the expo for the Army Marathon and chillaxed. • Sunday: ran the Army Marathon!!! This was an amazing experience, but as with the Austin Marathon, I’m not going to go into any details as they will all be in my race recap. • Monday: nada again. Resting my body after running the marathon. Honestly, I was nowhere near as sore as I was after I ran the Austin Marathon last month. I guess my body is adjusting to running marathons. I guess it was all like, oh, one of these again? That’s cool. Haha. • Tuesday: went to the gym. Was going to do Zumba as well, but I just didn’t have the time. I was tired and kept hitting the snooze and didn’t have time to do both by the time I got up. So, I just did the gym. 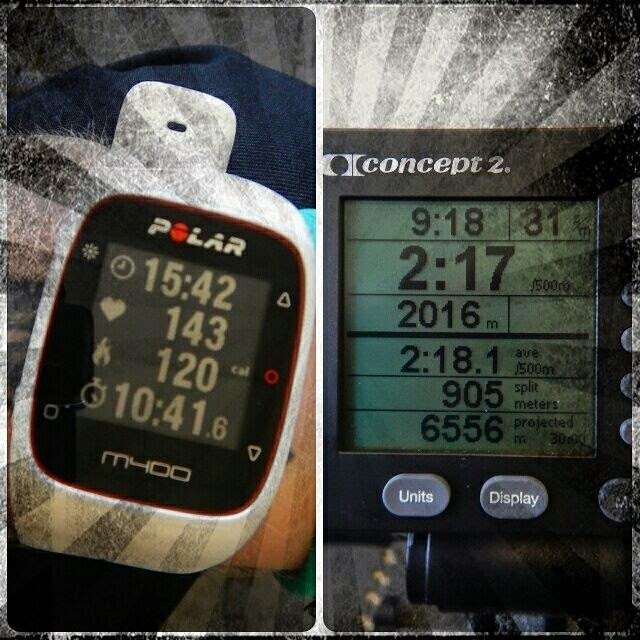 This was my first gym workout with the new Polar M400. I have to say, there must have been more wrong with my original one than I thought because the original one always said I burned only 90-something calories in a 50-60 minute strength training session. The new one said I burned over 400. Hmm. Maybe I didn’t have the heart rate monitor properly synced to the watch? I don’t know. I didn’t know how to change what the watch displayed during a workout so I could see what my heart rate was when I had the original one. So maybe it was just going off my movement. 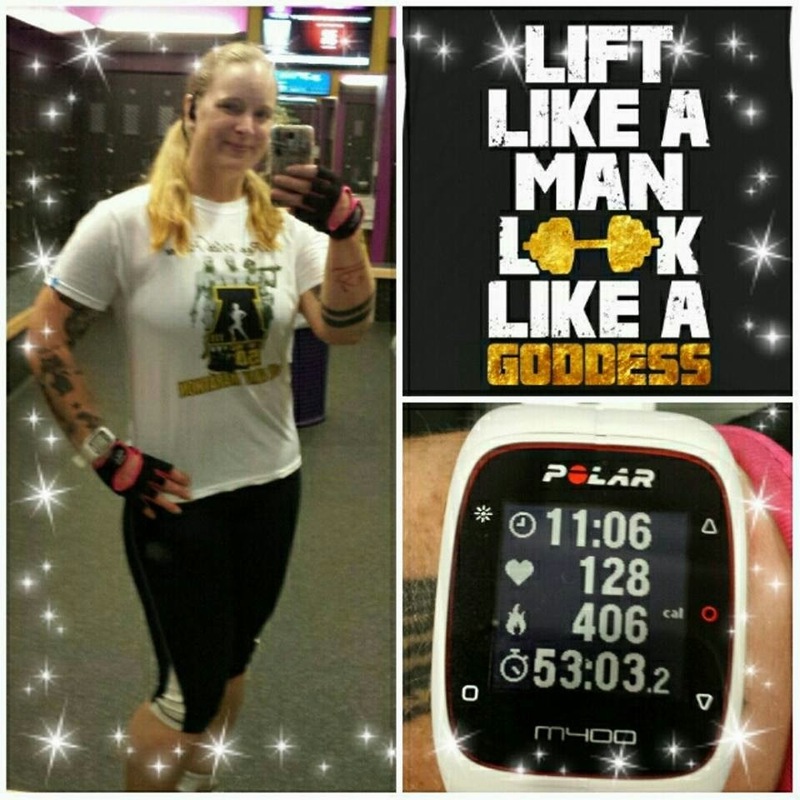 • Wednesday: I worked a double shift so no running or gym or Zumba, but I did manage to make it to the rowing machine at work this day…twice! YAY! I rowed a total of 4000-ish meters between the two goes at it. 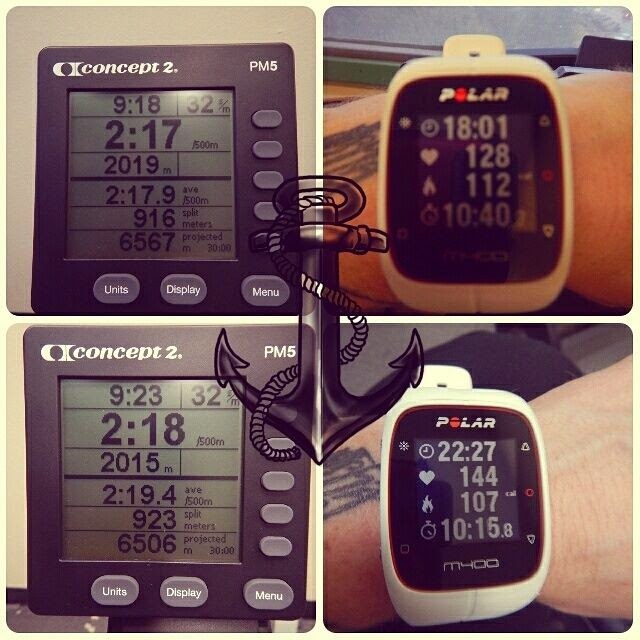 For my work, I have to be able to row 2000 meters in less than 9:40 minutes. The first go at it, I rowed it in 9:18 minutes. The second time I did it in 9:23 minutes. Awesome! • Thursday: worked another double shift the night before, so, again, none of my standard workouts were available to me. I hit the rowing machine again, though…so WIN! • Friday: when my alarm first went off at 8:30am, I reset it and kept hitting snooze until it was 9:40 and then I finally got up. I ran to the store and got the kitties some more food and then got gas and then back home. I changed into my running attire and headed out for what I hoped would be a semi-fast-paced 5K run. It was a good run, comfortably hard the whole time. 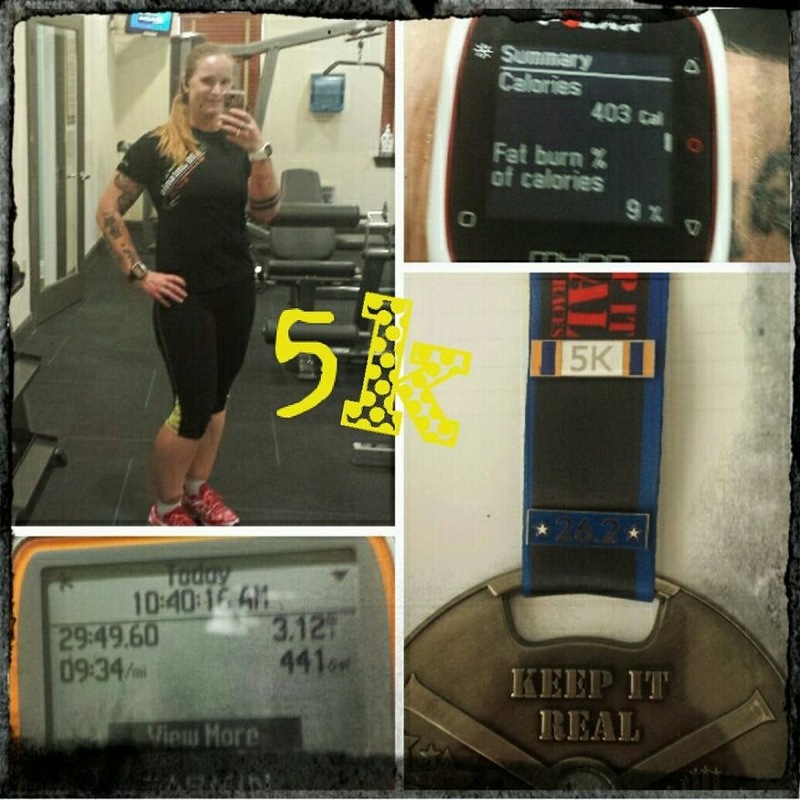 I know that I could have pushed myself faster, but I’m not sure about the minute per mile faster that I would need to drop in order to hit my goal 5K time of 26:41 minutes. I know with time and work and practice that I can and will happen, so I’m not worried about it at the moment. 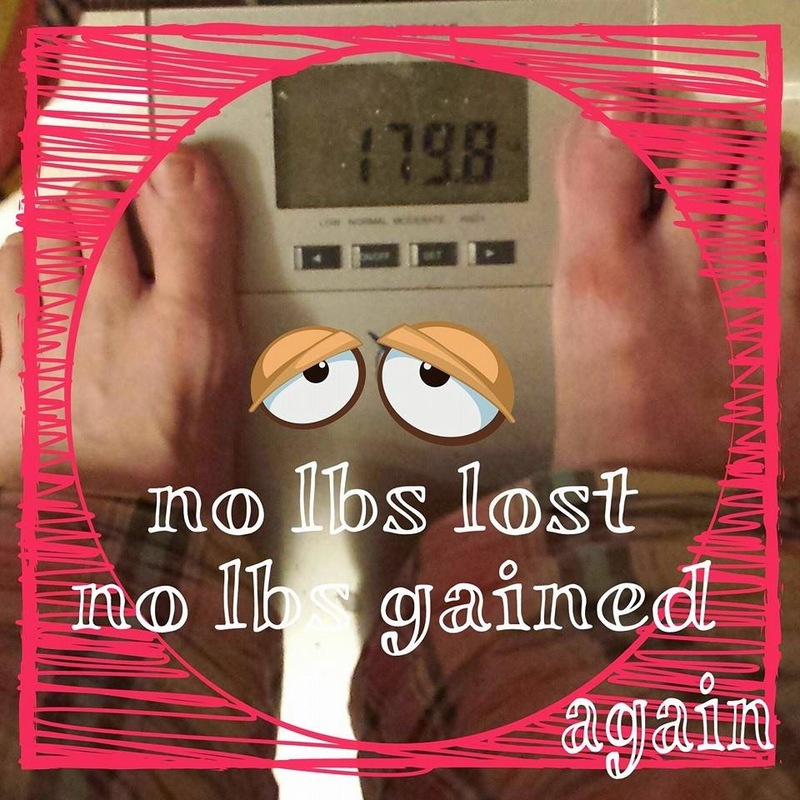 I’m not going to go over my eating in these Saturday posts anymore since I’m doing the WIAW posts now.